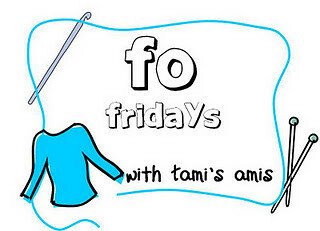 Last week I talked about my next Challenge To Myself. What I didn't talk about was the finished item from my last CTM. 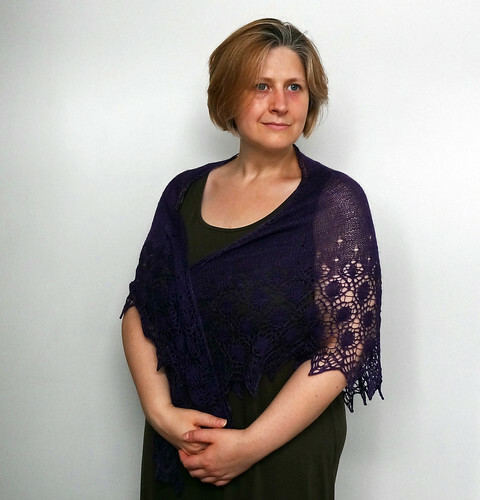 The CTM project in question is Dew Drops Shawl by Bex Hopkins. I started this project in March and it has hung around forever. I think this is partly to do with other projects taking precedence, and partly to do with the lace portion requiring a tiny bit more thought than I had anticipated. 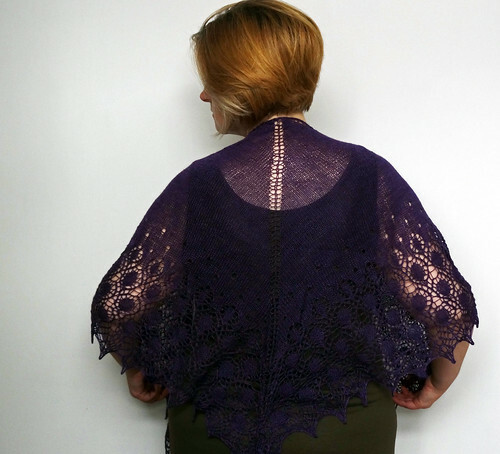 There is lace knitting on both the right side and wrong side of the shawl, when you get to the edging, which means there are no rows on which to zoom, without thought, along. I prefer my lace to have a rest between the rows where my brain is required! However, if the resulting project is worth it, I don't mind. I think this is worth it. With hindsight, I wouldn't have chosen this dress to wear when photographing something purple, but I'm afraid this is what I was wearing when I had the energy to photograph the shawl. I think you get the idea though. It is a lovely size of shawl. 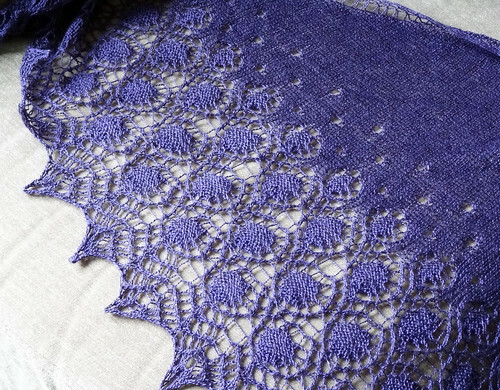 I did two additional of repeats of the stocking stitch part of the shawl, but decided not to add additional repeats of the lace charts to make the shawl bigger. 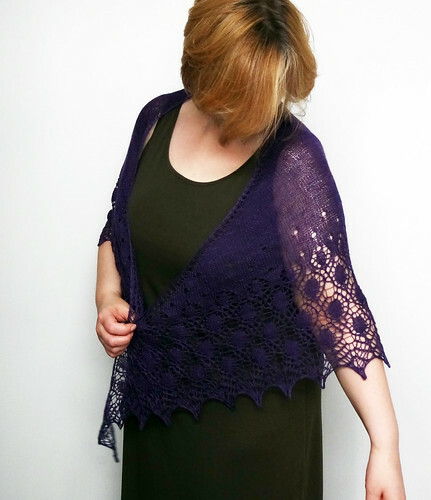 I probably could have got away with it because I have 100m left of the yarn, but I am happy with the size of shawl I have. I like shawls to cover my lower back, but not be too long that I end up sitting on them. I also like that the shawl comes past my elbows, but not so far it gets damp when washing my hands. The yarn is amazing. I'm glad I waited to become a better knitter before using it, because I bought the yarn in 2010, when I'd only been knitting a couple of years. The blend of camel and silk results in a yarn that blooms when it is wet blocked. It is so soft and warm it is unbelievable and the sheen is gorgeous. The silk gives the camel strength, and the camel gives the silk warmth and softness. I would definitely buy yarn from Artisan Yarns again. When I bought the yarn at a show, they had just started out, but they seem to be going well, which I'm really happy about. This yarn is definitely luxurious and worth every penny. I'm not sure if they still do this blend, but I know they had some other interesting ones, when I've seen them at shows, and they now sell some yarn through Loop Knitting. I think this pattern has worked out brilliantly for this yarn and I'm so happy I chose it. It has a large enough section of stocking stitch to really showcase the yarn, and the lace gives texture and interest. I couldn't be happier about how my Challenge To Myself is going. It has stretched and challenged me to use yarn that I was either scared to "ruin" or wasn't quite sure what to do with. I am pleased that not setting a time limit has kept me going without pressure. I think the other challenge I set myself at the start of the year is not going to happen, the Knit The Queue 2013 challenge. I think trying to both these challenges and the KALs and podcasting is just one challenge too far for this year. It did help me focus my mind somewhat, but I'm not going to follow that challenge in an active manner anymore. The CTM, however, is definitely going to stick around. I think even when I get to the end of the stash boxes, I'll just keep going round again because it is a great way to focus my mind on what stash I have and how to use it. As this is a Finished Object, I'm going to hook up with Tami, so click the button if you want to see other lovely finished objects.